Our doves live in a spacious loft within the Austin city limits. They have plenty of fresh air, sunshine, nutritious food and clean water. They are exercised daily, vaccinated against disease, and are banded with the breeders identification tag. The birds are strong and healthy and are capable of flying hundreds of miles in proper conditions. 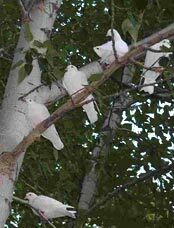 As a member of the Rock Dove Family, commonly known as white homing pigeons, it is instinctive for the birds to fly "home," back to safety and security of their loft. The doves will circle in the sky as they orient themselves to their surroundings, and then together they will begin their synchronized journey to their home base. 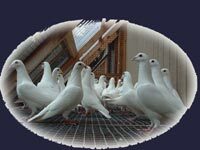 Our doves are carefully trained, and are accustomed to being handled by people and flying long distances. On "fly days," the birds' food and water are limited so there is no need to worry that the birds will 'mess' at an inappropriate moment. Rock Doves are capable of flying year round. However, we care very much about the safety of our birds, and there are certain conditions that will prohibit their release. Please refer to our Policies and Terms page for details.